"Everything is energy and that’s all there is to it. Match the frequency of the reality you want and you cannot help but get that reality. It can be no other way. This is not philosophy. This is physics." 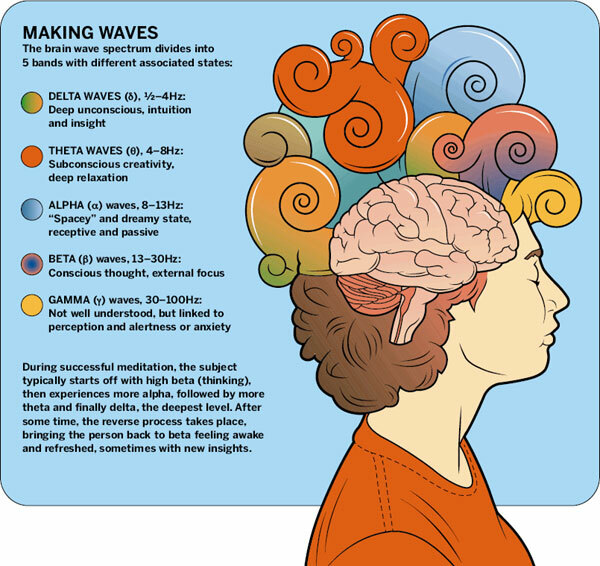 The benefits of meditation are well-acknowledged. Yet a scientific explanation of how it works has been conspicuously absent. Brown University scientists may have helped to overcome this barrier as researchers propose a neurophysiological framework to explain the clinical benefits bestowed by meditation. Scientists believe that mindfulness practitioners gain enhanced control over sensory cortical alpha rhythms that help regulate how the brain processes and filters sensations, including pain, and memories such as depressive thoughts. The proposal, based on published experimental results and a validated computer simulation of neural networks, is based upon the intimate connection in mindfulness between mind and body. This approach is consistent with standardized mindfulness meditation training that begins with a highly localized focus on body and breath sensations. The repeated localized sensory focus enhances control over localized alpha rhythms in the part of the brain called the primary somatosensory cortex, where sensations from different body are “mapped,” said researchers. In a paper found in Frontiers in Human Neuroscience, researchers said that by learning to control their focus on the present somatic moment, mindfulness meditators develop a more sensitive “volume knob” for controlling spatially specific, localized sensory cortical alpha rhythms. Efficient modulation of cortical alpha rhythms in turn enables optimal filtering of sensory information. Meditators learn not only to control what specific body sensations they pay attention to, but also how to regulate attention so that it does not become biased toward negative physical sensations such as chronic pain. The localized attentional control of somatosensory alpha rhythms becomes generalized to better regulate bias toward internally focused negative thoughts, as in depression. “We think we’re the first group to propose an underlying neurophysiological mechanism that directly links the actual practice of mindful awareness of breath and body sensations to the kinds of cognitive and emotional benefits that mindfulness confers,” said lead author Catherine Kerr, Ph.D. In experiments that Kerr and neuroscientist co-authors Drs. Stephanie Jones and Christopher Moore have published over the last few years, the team has used a brain imaging technology called magnetoencephalography (MEG). In these experiments, the researchers show that alpha rhythms in the cortex correlate with sensory attention and that the ability to regulate localized alpha brainwaves on a millisecond scale is more distinct in people who have had standardized mindfulness training than in those who have not. Jones developed a computer model that simulated the alpha brainwaves, through reciprocal interactions between the cortex, which processes information and thoughts, and the thalamus, which is like a switchboard that mediates information flow from the rest of the brain to the cortex. “We were investigating what are the brain mechanisms that can create this prominent alpha rhythm and mediate its impact on sensory processing,” Jones said. To accomplish this, the model predicts, meditators must achieve proper control over the relative timing and strength of alpha rhythms generated from two separate regions of the thalamus, called thalamic nuclei, that talk to different parts of the cortex. One alpha generator would govern the local “tuning in,” for instance of sensations in a hand, while the other would govern the broader “tuning out” of other sensory or cognitive information in the cortex. It’s a bit like focusing a telescope by precisely aligning the position of two different lenses. The authors’ framework hypothesizes that experienced meditators gain the ability to turn that proverbial focus knob to align those different rhythms. In the new paper, the authors propose that training chronic pain patients in the standardized mindfulness techniques of focusing on and then focusing away from pain, should result in MEG-measurable, testable improvements in alpha rhythm control.